I was just going through some things in my notes wondering what i should write about when i found this book that i forgot i read. 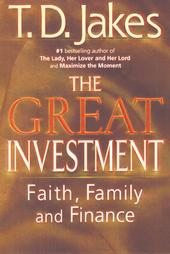 “The Great Investment” is written by T.D. Jakes. It covers faith, family, and finances. I read through the book pretty quick, but slowed down in the chapters alluding to tithing. I have to admit i am skeptical of T.D. Jakes because of his flaunting financial situation, and expected to hear mostly a false teaching about health, wealth, and prosperity. There was some of that in this book, but not as much as i expected. He does recognize that you cannot give to get and that getting is not exactly a direct result of your giving, or of your spiritual condition. Here is a statement that i did like what was said in his book. Now, does he mean that God owns a business? No, but he’s saying that God makes the right investments that a good business man would make. God is looking for those who have been good stewards. He will not leave precious talents to those who do not have the responsibility to handle them. I am really trying to focus this whole blog about the responsibilities of stewardship. I’m not completely focused about tithing, or other charitable donations going in and out of the Church. Yes, i do spend a considerable amount of time and energy writing about it, only because i do believe tithing is the largest sore in the Church today. If i were to sum up the word steward in one other word, i would say investor. I like the title of T.D. Jakes book, “The Great Investment”. If we look at our time, talent, treasure, as an investment option for when the King returns, America’s debt and financial problems would start disappearing. We wouldn’t be so concerned about the here and now. I’m not talking about investing in church buildings or anything like that, i’m talking about investing in people’s needs. The people have needs in America. But, take heed Church leaders, the biggest need is not another colossal worship center. Here’s a challenge for pastors: ask your congregation to write down the biggest financial need of their family, and i guarantee you won’t get one vote for a church building. It’s not even on their mind, until the pastor mentions it. If the people, who are the Church, do not have a Church building on the top 10 list of needs, why is it always on the top list of the needs for the Church? You might think that is an impractical way of looking at it, but really is it that impractical? In the stock market, you know what the most risky, volatile, but rewarding sectors is: Small Business. Most brokers feel safe putting their money in the large sectors like google’s, microsofts’, and apple’s, but when it comes to investing in small business it becomes risky. This is the way that our churches are thinking today. We want to invest in the big building, the big programs, and the big activities, because they are safe. In the end there is no small business investing going on so our individuals get overlooked. Investing in individual people is very risky if you ask me, but let’s face it, they have the most to grow. Anyways, i didn’t really mean to go on a tagent there, it just happened. T.D. Jakes book had some good things, but of course there were some things i could pick out that i didn’t like. I don’t care if you think God’s called you to be prosperous. I don’t care if you think God’s called you to be a pauper, just remember that the richest king in the universe invested everything he had in the small business sector for you. So how should you invest and return it back to him? iNVESTING IN INDIVIDUAL PEOPLE IS VERY RISKY IF YOU ASK ME,BUT LET’S FACE IT,TEY HAVE THE MOST TO GROW. WHY IS IT SO RISKY ? WHAT DO MEAN THEY HAVE THE MOST TO GROW? I am sorry i havn’t responded earlier. My email has been down due to a spam attack on the servers. I can give you an example of why it can be risky. My brother has been in and out of jail numerous times. he’s been on drugs. He’s made lots of bad decisions. Most of the time when you go out of your way to help him, not much comes out of it.There are some people that if you you invest in them a lot comes out of it. I guess the thing is when you have invested time and money into one person, they have an individual decision to make with what God has given them. Now if you want to invest in an organization, more than likely there’s multiple people making decisions, which results in better accountability. If i give them $1,000 it will make a little bit of an impact, because more than likely they have to cover the costs of overhead and other things. but if i give that $1,000 to an individual who needs to buy a car so they can go to work to provide for their family, then you can see the impact that has. Maybe it is just my opinion that investing in individuals can be risky, but compared to a mega church giant organization, individuals do have more room to grow.